This version of the Uru Glossary contains only the items of Uru - Ages Beyond Myst and The Path of the Shell. uru liveThere are several names, terms and expressions used in Uru (many of them originating from the slang of the early explorers), which are unknown to new adventurers. To help them we have created this brief glossary. We are aware that some spoiling is inevitable, however, we have tried to keep this to a minimum. Items in pink are basic terms in Ages Beyond Myst (ABM), the CD game. Items in yellow are available only in the expansion pack The Path of the Shell (TPOTS). Items in light green color are referred to as OOC. On touching or clicking any of these small icons an additional image pops up. Ae'gura The biggest and highest island in the huge lake of D'ni, part of the city. For the time being, explorers are allowed to move only in this district. In Uru ABM you can cast only a few glances at it from balconies or rooftops. Age The different worlds (available via the Books) were called Ages by the D'ni. Ahnonay Age Four in one or one in four? An Age with an interesting island around a clocklike device... and much more. Ahnonay Cathedral A separate small Age, an important alternative access point to the Ahnonay Age. Called also the Temple or Chapel. Ahyoheek table A game of chance resembling rock, paper, scissors. Heek tables were found in every well equipped Neighborhood. No working heek tables are known currently. Pronounced "ah-yo-heek" or "eye-o-heek" (often misspelled as "ayoheek"). Antechamber room Your first visit to the Great Zero starts in this small room. Atrus Atrus and his wife Catherine, their children Yeesha, Achenar and Sirrus, his father Gehn, his grandfather Aitrus and grandmother Ti'ana (Anna) from the surface of the Earth do not appear in Uru (except Yeesha), however, they are the key characters of all Myst games and the three books. Bahro Caves By collecting all of the Journey cloths of an age, you can open and enter the Journey doors and link to a Bahro Cave, the hiding place of the Bahro pillars. Its exact physical place within D'ni is still a controversial issue. It can mysteriously change its appearance. Another Bahro cave has an important role in TPOTS, too. Bahro caves were probably the past dwelling places of the Bahros. Bahro Pillars These pillars, which resemble totems, are found in the Bahro cave and play a central role in your Uru quest. Bahro Stones 1) Linking cloths mounted on a stone slab. These usually give access only to a separate part of an Age (a room or a balcony, etc). 2) A big chunk of stone in a balcony of the Neighborhood. Several glyphs can be seen on it. They are clues on how to complete your exploration in Uru Prime. Balcony jump The (not an easy) jump from the balcony of the Neighborhood down to the Classroom roof was a kind of sport in Uru ABM (in later versions it is already impossible). Ball hall Part of the Sanctuary. Baron's city office (BCO) Although this room can be found in the city, it is available only by linking from Teledahn. Here, you can find some interesting papers and Sharper's journals to read. Basic Ages The five ages to be solved to fulfil Yeesha's quest. Teledahn, Kadish, Eder Gira and Eder Kemo, Gahreesen. Without these you probably cannot advance at other places either. Buggaro A flying member of the fauna of Teledahn. Canyon 1) The deep fiord in the city, right downstairs from the courtyard, on the way to the Concert Hall; 2) The accesible part of Er'cana. Cavern 'Cavern' includes everything in the vast cave of D'ni: the city, Ae'gura, the Neighborhoods Bevin and Kirel, the Great Zero etc. City While this would mean the main city, the D'ni capital, in Uru it refers to Ae'gura, the biggest island in the lake. City Proper The coastal part of the city. For the time being, it is unavailable to the explorers. Classroom Located in the Neighborhood. Cleft The starting place to explore the D'ni universe. A crack in the desert at the foot of a dormant volcano, the one-time dwelling of Ti'ana, Gehn, Atrus and Yeesha. Clock 1) The huge D'ni clock can be found in the Neighborhoods; 2) An important big clock-like device in Ahnonay. Not a radar and not a clock but something between. Community center A big auditorium located in the Neighborhood. Conference rooms They can be found in Gahreesen Training Center. Control rooms They can be found in Gahreesen Training Center. See also Maintenance room. Courtyard Used in connection with several places: 1) At the upper end of the great stairs in the city; referred to as Tokotah square as well; 2) In front of the Library in the city; 3) The central part of the Great Zero. Crystal trees or ice trees. They grow somewhere in Ahnonay. Display rooms They can be found in Gahreesen Training Center. D'ni Riltagamin The desert and the cleft are called by this name, in fact, it means probably the unknown parts of the Earth Age. D'ni Rudenna A separate cave of D'ni. The passage between the main cavern and Rudenna was opened about 3000 years ago. The Bahro cave is probably situated in this part of D'ni, but its exact place is unknown. Dock area The west part of the ferry terminal. Do not confuse it with one that came from a Relto page. DRC Acronym for D'ni Restoration Council (archived old site). Its main purpose was to oversee the exploration and restoration of D'ni. The council was headed by Dr. Marie Sutherland, Dr. Ikuro Kodama, Victor Laxman, and Michael Engberg with Dr. Richard Watson as chair. There were also numerous volunteers who served in support roles. In February, 2004, all restoration efforts were cancelled and the cavern was evacuated and closed. The site began showing renewed signs of activity in February, 2006. Eddie the Beachball 'He' can be found in the Neighborhoods. The name originates from the early ages of Uru and the first explorers. It is rumored that Eddie can sometimes influence the events in Uru. Earlier his relatives Jackie and Lillie the pumpkins were seen, too. Eder Gira Age The sister age of Eder Kemo, the age of fumaroles, volcanic steam vents, lava flows, water falls and caves. Eder Kemo Age A.k.a. Garden Age, the beautiful sister age of Eder Gira. Eder tomahn Old D'ni way stations in the endless maze of D'ni tunnels. Egg room Located in the Neighborhood. Its purpose is still debated in spite of the several expeditions made by the early explorers. The Egg room is not always open. Around the "egg" there are five small Private rooms. Engberg, Michael Michael Engberg, former member of the DRC, was an expert in architectural structure and history, and was in charge of the physical restoration process in D'ni. Er'cana Age The Age with a big industrial complex in a canyon. One of the food producing Ages of the D'ni. Ferry terminal The starting point in the city, Ae'gura. Fire marble These small luminous marbles were used in the lamps and lanterns in D'ni. Flappers A member of the Teledahn fauna. Garden of Lights A nice place in the Neighborhood. You may meet Eddie here. Gahreesen Age The age of the Guild of Maintainers. It contains two fortress-like rotating edifices. Garry The Gahreesen gator whom you can hear roar occasionally from the exterior Gahreesen areas. Glow Room The place of the third puzzle in Kadish, in a pyramid-shaped building. Great Shaft A huge oval well that rises straight up toward the surface with stairs spiraling up along its sides. Part of the unfinished way to the surface, build by the D'ni a few hundreds years ago. Great Tree The huge tree can be accessed somewhere from the city. It has also a symbolic meaning in the D'ni philosophy: it represents the "Great Tree of Possibilities", the endlessly interweaving maze of all possible Ages in the universe. Great Zero (GZ) The center of the D'ni position system in a separate, ancient part of Ae'gura. The calibration of the KI also takes place there. The Grower A prophesized person in the D'ni history, mentioned in the prophecies of The Watcher. Guild Hall The large building you see in front of you and high above the Tokotah courtyard, in the mountain, when you walk up the Great Stairs in the city. Currently under restauration, not available to visitors. Guilds The one-time D'ni society based on the subtle system of the 18 major Guilds (Guild of Writers, Maintainers, Miners, Book-makers, etc.) and numerous minor Guilds. Government, education, culture, science etc., even everyday life were strongly influenced and interwoven by the Guilds. Guild of Writers The Guild of Writers are a group of talented people creating new "user-made" Ages which can be played offline with Uru CC or TPOTS. Henderson, Phil Originally Phil Henderson was a Restoration Engineer working with the DRC, but later after a mysterious long journey he was abducted by the DRC, and he had contact mainly with Sharper only. He died in a cave-in accident in the city in December, 2003. His body has never been found. Hourglass Cave or Pellet Bahro Cave. One of the Bahro Caves. Hydrant The dumpy columns at Relto with a Book inside. Imager A device for displaying images and messages at different places. You can place images or messages to the imager at your Relto. Industrial complex A huge processing plant in Er'cana including a mill, grinder, treatment or mixer pools, baking room or burner, pelleting machine, etc. Another industrial complex was found on the south side of the D'ni cavern, but the explorers never had access to it. Journey cloth A piece of tapestry-like cloth with a stylized hand on it. All of them are to be collected in each age. They are used as bookmarks in the ages as well. Sometimes referred to as Journey hand. In TPOTS, in Er'cana and Ahnonay they have a shell on them and are used only as bookmarks. Journey door These massive doorways, one in every Age and bearing the same hand marking as the journey cloths, lead to the Bahro cave. To open them, you have to collect all of the journey cloths in that particular age. Sometimes referred to as Yeesha doors. J'Taeri A district of the city. Kadish Gallery A separate hall in the city, available only via a linking book. The magnificent stained glasses on the walls may contain clues to the puzzles of the Kadish Age. Kadish's quarter The one-time hidden place of good old Master Kadish in Ahnonay. Kadish reflections When closely scrutinizing some puddles in Kadish, strange reflections appear in the water... Examine the puddle after the moon room in the short tunnel in first person mode. Kadish Tolesa Age This Age of gigantic trees was once created by Master Kadish to hide a cache (vault) in its secret caves. To access the cache, several puzzles have to be solved. Keanulint A member of the fauna of Eder Kemo, it lives high on the edge of the rocks. Kerath's arch The enormous arch over the entrance of the harbour of Ae'gura, named after Kerath, the last and greatest king of D'ni. KI The wristwatch-sized D'ni communicator. It is a must for every explorer in Uru. You can take pictures with it, after calibration it shows the D'ni position coordinates. Kings' Hall The big round hall (rotunda) in the palace, upstairs from Tokotah courtyard. Its walls are adorned with the names of the D'ni kings. Kirel This bluish colored place is one of the Neighborhoods. Kodama, Dr. Ikuro Dr. Kodama was a member of the DRC and an expert in geology and structural integrity. K'veer An island of the great D'ni lake with a mansion on it, it belonged once to an upper-class D'ni family. 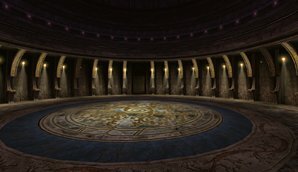 In one of its halls Atrus was imprisoned twice: first as a young boy and many years later again, when he already lived in Myst island. Laxman, Victor Victor Laxman was the fourth member of the DRC and the chief engineer for the restoration effort. Library 1) The magnificant building of the Great Library is at the far end of Ae'gura. Do not confuse it with the rooftop office (workshop) at the Tokotah building; 2) A small hall in Myst island, where the library of Atrus was many years ago. Maintainers' mark A small yellow mark in the rocky ground found in several Ages, the purpose of which is somehow connected with the D'ni position finding. Maintenance room An important place in Ahnonay, accessible only with difficulty. Sometimes referred to as mech(anical) room or simply as 'control area' or 'control room', although there are several other 'control rooms' in Uru. Maps Several maps are available from the site of the Guild of Cartographers. Marker The white disk shaped pulsating markers are used 1) in the KI calibration procedure; 2) in the one-time marker games as it is written in a notebook in the Training center. Moon room The place of the second puzzle in Kadish. MREDU Acronym for Myst Riven Exile D'ni Uru, an often used term in the forums when speaking generally about these games or the Myst universe. Mud Rooms Vestibules attached to the rotating bridges of the Training center in Gahreesen. Museum A recently opened building near the Tokotah (Dakotah) courtyard, Ae'gura. Myst Age Yes, the well known and now abandoned Myst island of Atrus and Catherine is available (partially) again via The Path of the Shell! Neighborhood An outlying section of D'ni. The Neighborhoods are situated in the cavern walls of D'ni. Only a balcony is available in Uru Prime. They were excellent places for social activities of a larger group of people. Neighborhoods vary in their equipment and décor. 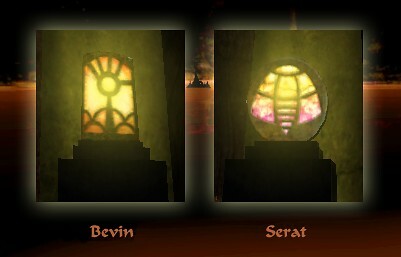 There are two basic types, Bevin (common) and Serat (rare), distinguishable mainly by the shape of their lamps. Recently only Bevin and Kirel are accessible. Nexus Age Nexus is a kind of personal central terminal or station. It contains all of the available links within the cavern. The Nexus linking mechanism cannot be used without the KI. Not available in Uru Prime. Nexus terminals Several are found in the city around, these are used for registering the KI in order to obtain additional direct links to the city. Niche (in Teledahn) It can be found in a secret place and contains a linking stone to an even more secret place. Non-player characters This can apply to people in history or in the story of Uru, like Atrus or Yeesha, as well as to people who are part of the Uru story, like members of the DRC, or Douglas Sharper and Phil Henderson. Observation room 1) Antechamber room of the Great Zero (sometimes called observation deck); 2) sometimes the Control room of the Wall in Gahreesen Training center. Panic linking In dangerous situations the avatar automatically touches his/her Relto book and links back to Relto. Pavilion Resting places with benches in Kemo. Pellets You have to make & use them in Er'cana. They contain nutrients for the luminescent algae of the D'ni lake. Pellet Bahro Cave or Hourglass Cave. One of the Bahro Caves. Phil's Relto A Relto at night... Phil Henderson's Relto book is in a well hidden place in the city. Pillar room The place of the fourth puzzle in Kadish. Power room The place of the rotation mechanism of the 1st building in Gahreesen, as well as of the timed puzzle to enable the energy system to the Maintainers' buildings. Prison room 1) Found in the prison level of the Training center in Gahreesen Age. Worth visiting; 2) Slave room in Teledahn Age. Pub 1) The one-time tavern in the harbor of Ae'gura, by the side of the main stairs. 2) The Watcher's Pub Sanctuary. Puffer A bulbous member of the flora of Eder Kemo. Quab These small crablike creatures live in Ahnonay. Relto Linking Book The special linking book attached to the explorers' belt. By using it you return immediataly to your own Relto. Relto pages Pieces of paper you find lying around (1-2 per ages). They add a page to your Relto linking book and add the feature pictured to your Relto, i.e a waterfall, etc. Sometimes referred to as Yeesha pages or Treasure pages. Rolep Improper name of the Sanctuary. Rolep was probably, according to the Watcher's Journal, another cavern in D'ni. Sanctuary A secret place in the city, available through the appropriate linking book only. The ancient meeting place of the Watcher and his followers. Referred to as the Watcher's Pub or the Great Tree Pub as well. Sharper, Douglas Douglas Sharper ("Mushroom Baron") was not a member of DRC, but has got full rights to explore Teledahn. When D'ni was emptied at the beginning of February, 2003, he did not follow the explorers and the DRC but remained alone in the cavern. He was in good relations with Phil Henderson. Shroomie A charming member of the fauna of Teledahn. She lives in the sea and is difficult to lure and see. Shrooms The halls and rooms found in the giant mushrooms of Teledahn. Silo You can link to there from Er'cana. Its exact place is unknown, probably somewhere in the city in an industrial district called Uran or originally D'ni Ashem'en. It served to store food for the luminescent algae living in the lake of the Cavern. Slave room In underground Teledahn the place of the puzzle with the seven mats and the locked gates. Spiral island One of the islets around Relto, with a spiral rock formation. Spy room A hidden place in the city. Douglas Sharper and Phil Henderson used it to spy through a telescope on the Tokotah office of the DRC. Stalagmite There are many around, but this particular one is found in the middle of the courtyard, top of the great stairs, Ae'gura. Sometimes referred to as "split stalagmite" or "tree stump" or "tree arch". Star fissure An anomaly, a gap in the space-time structure of the Ages, maybe a glitch between the dimensions... It has a central role in the connections between the Ages of Myst, Riven and Earth. The Stranger An unknown person who found a linking book to Myst on the surface of Earth and freed Atrus from his captivity in K'veer. Later he freed the imprisoned Catherine in Riven. Strip Mall or Canyon Mall, the street along the canyon in Ae'gura. Sutherland, Dr. Marie Dr. Sutherland was the Director of Field Work for the DRC. Sutherland point The small plaza over the canyon, after the Kings' Hall, in Ae'gura. Sometimes referred to as Palace courtyard. Teledahn Age The age of the giant mushrooms. Telescope These gadgets can be found in several Ages. Sometimes only to look and see, sometimes they are connected to other devices and have some definite purpose. Telescope puzzle or tree ring puzzle. The first puzzle in Kadish. To D'ni The first expansion pack of Uru Prime. You can explore the island Ae'gura, the center of the vast underground D'ni city. Tokotah Buildings I and II They are found at the upper end of the Great Stairs in the city, on the Tokotah Alley. Building I is behind the DRC tent, building II is opposite to it, above the Nexus station. It has a makeshift office on the roof, sometimes referred to as DRC office, workshop or library, available only through the appropriate linking book. An alternative old spelling is Dakotah. Tomahna Age Originally an ancient D'ni word meaning home... well, you'll reach this Age sometime, somewhere... do your best! However, it is still debated whether Tomahna is a separate Age or not – probably it is a distinct but very close parallel Age. Tower Although several tower-like structures can be seen in Uru, this particularly important one is in Ahnonay. TPOTS, POTS Acronym for The Path of the Shell, the second expansion pack (and it contains the first one, too). It covers a separate adventure in Er'cana and Ahnonay. Training Center The second giant fortress-like rotating building in the Gahreesen Age. Treasure Books Certain Ages may have multiple linking books. These books link to new parts of the Age, which are inaccessible from the "normal" link-in points, very similarly to the Bahro stones. Tree ring puzzle or telescope puzzle. The first puzzle in Kadish. Troom A member of the flora of Eder Kemo, it has a characteristic brainlike appearance. Uru A D'ni word meaning "large gathering" or "grand community". However, it is an ancient word here on the surface, too: uru - Sumerian and Neo-assyrian "city", Sanskrit "wide, large"", Hebrew - "awaken" etc. From uru comes Ur, the name of the one of humanity's earliest cities. Uru CC Acronym for Uru - Complete Chronicles. 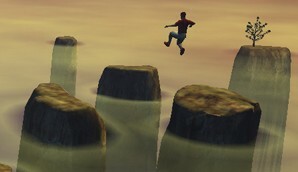 This edition of the game contains Uru - Ages Beyond Myst and Uru - Path of the Shell in one. In other words the original game plus the two expansion packs. Uru Prime, Uru ABM The basic game in the Uru universum. It covers the adventure in the Ages of Kadish, Teledahn, Gahreesen, Kemo and Gira. XP Acronym for expansion pack (XP1: To D'ni, XP2: Path of the Shell). Yeesha The daughter of Atrus and Catherine. She developed further the Art of Writing and was able to create among others the special Linking Book to Relto. Yeesha's quest The primal quest in the five basic Ages. Yeesha's shell You may meet it in different forms in the expansion packs. They are always important! Vault The place of the last puzzle in the Kadish Age. It is worth visiting and checking later from time to time. Vogondola A chair-like device in a suspended cockpit used for transportation on Ahnonay. Wall Massive training and testing facilities in the huge central hall of the Gahreesen Training Center. You may glance at it from the Conference or Control rooms. Warshrooms The rooms of a giant mushroom in the back area of Teledahn, with many crates around. The Watcher A D'ni prophet who lived thousands of years ago, the founder of the Sanctuary. The Watcher recorded his visions of D'ni in a 625-line booklets entitled Words, divided to 5 sections. Well area The center part of the 1st building in Gahreesen Age. White, Nick He is one of the Restoration Enginers. He started to learn D'ni in 1998 and translated many D'ni documents to English. Zandi, Elias Elias Zandi was an archaeologist and one of the original explorers of D'ni in 1988. He established the D'ni Restoration Foundation which helped to fund the work of the DRC. In 1996 he died of a heart attack. Zandi, Jeff The dude sitting in front of the caravan in the desert and greeting the new explorers. If necessary, he may provide some nudges. He is the son of Elias Zandi, one of the initial discoverers of D'ni. Zandoni One of the easter eggs. Have a nice ride! A beautifully rendered pdf version of this Glossary (created by Ayli) is available from the Guild of Greeters web site. More additional info can be found in the archives of Guild of Greeters, D'ni Pedia Writers, MYSTlore wiki, Wikipedia (Myst franchise), Wikipedia (Uru), Uru Obsession, Myst wiki, Myst Ages, (and on many other sites as well). Bear in mind, however, that usually the more detailed the info the more you are spoiled. We hope that it will help you in your Uru quest! Created by Norfren, with many thanks to Taliametris, Ayli and Myrlein for their help. All D'ni, Uru related images, names and other things © Cyan Worlds, Inc. - All rights reserved D'ni®, Uru® respective Logos® Cyan Worlds, Inc. Used with permission.